Frank Huang is destined to be one of Houston’s great musical sons. Arriving in the Bayou City at the age of 7 from Beijing, he quickly set himself apart as a violin virtuoso, performing with the Houston Symphony at 11. His accomplishments include winning the 2003 Walter W. Naumburg Foundation’s Violin Competition, the 2000 Hannover International Violin Competition, and a Grammy as part of the Ying Quartet. In 2010 he took the reins as concertmaster of his hometown Houston Symphony, and in 2015 he was named to the same role in the New York Philharmonic. Huang has long been an aficionado of quartet work, so in 2017 the New York Philharmonic established its own string quartet for the first time, pairing Huang with Sheryl Staples on violin, violist Cynthia Phelps, and cellist Carter Brey. The string quartet makes its Houston debut March 29 at Da Camera, so we spoke to Huang about why he loves the quartet genre and what he’s excited to return to in Houston. Tell me what it means to you to be performing back in Houston. Is this a homecoming for you? Of course, it is still my hometown, my parents live there. I look forward to going back any time and I’m excited also because my colleagues don’t know Houston as well and I’m looking forward to showing them the city. What is your favorite part about performing with a quartet as opposed to with a full symphony or orchestra? Quartet playing has always been my true love for the art form. When I was in school studying with my quartet teacher, [Cleveland Institute of Music’s Donald] Weilerstein, I loved the repertoire, and I love the intimacy of it. Having the opportunity to play quartets with people I play with in a larger ensemble has so many added benefits, it makes us more cohesive—we get to know each others’ taste and style, how we like to work, how to be efficient in rehearsals, and a lot of that translates back into our sections in the orchestra. 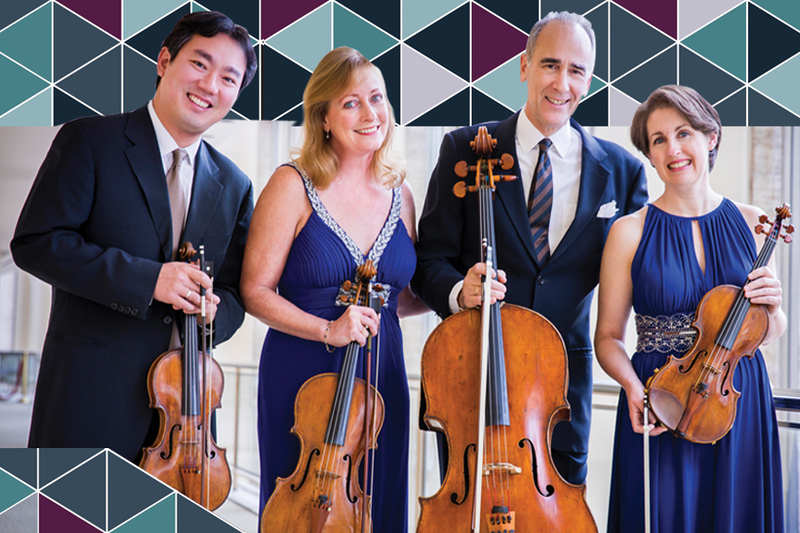 This is a young quartet—does the group have its own personality? I’m curious if being a founding member of a new group is different then joining a group. What kind of benefits does a clean slate offer? The initial formation of a quartet is the most enjoyable and most work-intensive because you’re getting to know each other’s style and taste, not to mention personality and whether you get on as people. When we started rehearsing together, we knew it was going to work. We are all used to dealing with more complicated situations than quartet and with our combined experience it was easy to work together. We didn’t have to work on how to fix intonation or ensemble—having Sheryl and Cindy and Carter, they played a lot of chamber music and a lot of string trios together, and from years in the orchestra together they knew each other’s styles and preferences so it was a little like joining a pre-existing group, just a different repertoire. I don’t know that we have our own calling card. A lot of quartets have an image or a sound or something they try to capitalize on, but we’re new enough and yet experienced enough our main priority is to make quartet music as enjoyable and meaningful as possible. It’s such a treat for us to be able to play in this form after playing so much orchestra music, to have that control over how you want the music to interact with the audience, how you want them to feel, is very enjoyable. We’re trying to play a wide variety of music and figure out what works for us and what we’re the best at. So far we’ve been playing a little bit of every time period and genre you can think of, and its been super fun. Tell me a little about the program—is there a piece stands out for you? What makes these works interesting or different? It’s a pretty interesting mix. The Haydn is super fun to play; the fifth is built up of these different people taking turns at intervals and different fifths, it’s a good showcase of Haydn’s genius and why he was such an unbelievable quartet writer. The Shostakovich one of my favorites works by him that’s not played very often—in my experience its one of the more unique and special pieces in that genre. People will enjoy hearing that especially if you aren’t familiar with his music or his quartets. Sometimes people aren’t so excited about a Shostakovich or worried that it’s too modern but more often than not we get the response that that was one of their favorites on the programs—a very gripping and beautiful piece. And the Brahms is good, old-fashioned, beautiful music. It’s very introspective in some ways, and I always wonder if people think about their lives or something important when they hear it. It can be a very moving experience—our goal is make the music memorable and something to reflect on. What else is on your to-do list or to-visit list while you are in Houston? It has to be food. A lot of my favorite restaurants that I used to love going to, I’m hoping to bring my colleagues to experience. I might take them to El Tiempo, for example, for fajitas, or Uchi is a place my wife and I like to go. There are so many great restaurants and award-winning chefs—its one of the greatest food towns in the US—so its going to be hard to fit everything I want to eat into a short trip.